Cycling in France is a wonderful experience when compared to cycling somewhere like the UK. France is a big country blessed with an enormous variety of landscapes ranging from big mountains through to undulating foothills on down to flat river plains and canals. 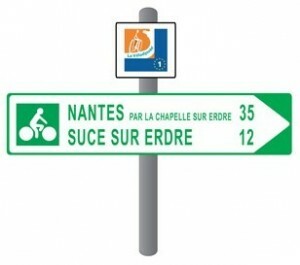 This means there is cycling in France to suit all abilities. But we’re not just talking road biking here. The country is also a mecca for the mountain biker with dedicated mountain biking centres with waymarked mountain biking circuits located in almost every region. France is a fantastically family-friendly country. Throughout the country, disused railway lines have been transformed into family-friendly cycle ways o r ‘voies vertes’ which means ‘greenways’. Cycle ways have also been created along riverbanks and canal towpaths, coastal paths and through city parks. These are reserved for non-motorised traffic and are perfect for a family outing on the bikes. 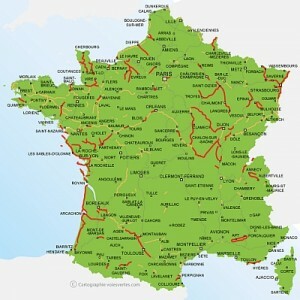 There is a superb website which shows you where in France you will find these cycle ways. You may choose to take your own bikes on holiday with you but cycle hire shops are commonplace and the bikes usually well-serviced and of good quality. In addition to the greenways, ‘parcours cyclables’, have also been created across much of France. These waymarked point to point medium to long distance cycling routes link up towns and regions. They generally use the quieter and more picturesque backroads. The signposting is clear and unambiguous. Along with the Eurovelo routes, these can form a great itinerary for the cycle tourer looking to explore France by bike. Explore sections of the Vélodyssey Atlantic coast route which runs from Roscoff all the way down to Hendaye on the border of France with Spain. Alternatively, the Loire à Vélo route is well worth discovering. It follows the Loire river from its source near Nevers, through the picturesque Loire Valley to the river’s estuary on the West coast near Saint Nazaire. Normandy and Brittany are particularly well catered for when it comes to waymarked cycling itineraries. Explore sections of either the ‘Tour de Manche’ or the ‘Petit Tour de Manche’, staying at bed and breakfast accommodation on the way. The route is well signposted as you would expect, running from the port of Cherbourg, down the Carentan Peninsula before heading West along the coast via Mont Saint Michel to Roscoff. Everybody has heard of the Tour de France. The Cols of the Alps and the Pyrénées are legendary, many serious road cyclists will have them on their ticklist and the scenery of the higher mountains is admittedly breathtaking. 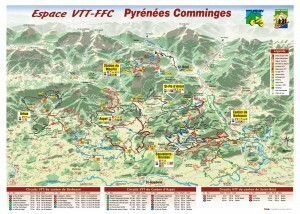 However, you don’t need to hit the cols to get some good exercise on a cycle holiday in France. The foothills of the Pyrénées and the Alps, the ‘lumpy’ landscape of the Black Mountains near Carcassonne in the South of France and the undulating hills of the Auvergne for example can all present a serious challenge for the road cyclist. You can easily knock off hundreds of kilometres of quality riding on quiet lanes and back roads and return home with a real sense of achievement. Mountain biking is a very popular sport in France and the XC or cross-country mountain biking scene is developing rapidly. There are 179 dedicated mountain biking centres dotted throughout France making up over 62,000 kms of colour-coded waymarked circuits! The circuits are generally well signposted and colour-coded from green to black so you can easily choose a route which suits your ability. There is mountain biking in France for people of all abilities and it’s a great way to get into the heart of the countryside.